The Oppo foldable phone may not become a reality for somewhat longer than we initially hoped, but it's got plenty of people excited. It's now been shown off in new images from our pals with the rendering machine, over at LetsGoDigital. The pics suggest a pop-up camera that could mean a real edge-to-edge display – a world first for foldable phones, and something even the Samsung Galaxy Fold hasn't managed. The Oppo foldable phone first appeared in documents and patents, and these images are based on the details that were revealed in those papers – specifically about design and build. 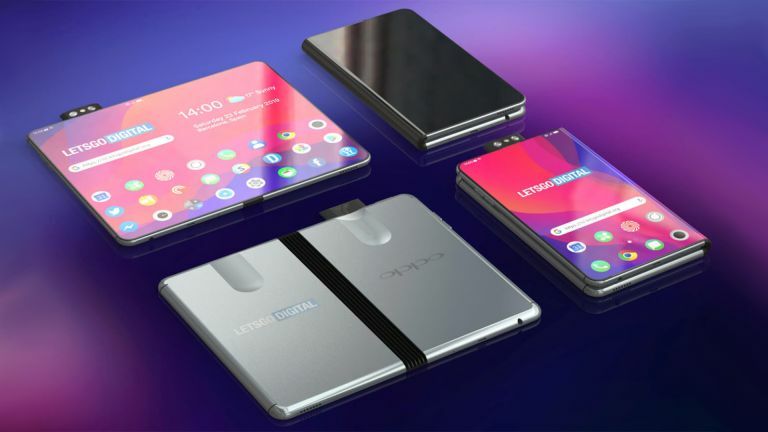 Oppo has already officially shared its plans to build a foldable phone but, until now, little else has been known about the fabled device. Many model variations were applied for in the patents but one thing that is common is the fact that when folded the screen will remain on the outside. So the large tablet-like display folds leaving a screen on the front and back of the phone. That near full screen display is achieved by putting the selfie camera and rear camera all in one module that slides up out of the phone's top. We've already seen this sliding camera design in current phones, just none that fold, yet. Expect to hear more on this as foldable phones become the norm in 2019.